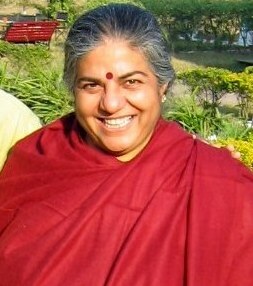 Vandana Shiva, environmentalist and feminist, recently spoke at the University of Oregon as part of a program celebrating International Women’s Day. She began by saying that the issue of women’s power is partly about recognizing the traditional wisdom of women in many societies. She cited the example of Indian women who fought against the cutting down of forests in the Himalayas during the 1970’s. The erosion from the mountains subjected to these cuttings was damaging the Ganges river. Their efforts ultimately resulted in a ban on such cutting enacted in 1981. She then went on to say that the real patriarchs of today are corporations. She pointed out that 200,000 farmers in India have committed suicide because of the genetically modified cotton they are forced to grow, which does not allow them to save seeds, which they need to do to be economically self-sufficient. She talked about how genetically modified alfalfa is being brought to the Willamette valley in Oregon. The cross-pollination of this crop with the crops on other farms will make all the alfalfa farmers subject to Monsanto’s patent. It will also make organic farming (in the true sense of that term) impossible. Shiva calls this “eco-imperialism”. She pointed out that before the advent of genetic engineering, farmers developed thousand of different varieties of rice, that can be grown under all sorts of different conditions. Genetic engineering only serves to create corporate (mainly Monsanto) control of the food supply. Shiva also talked about the idea of “eco-feminism”, which is the idea that environmental degradation and the oppression of women are related. This is certainly true in the sense that capitalism encourages both. This entry was posted on March 5, 2011 at 8:14 am and is filed under Capitalism, Environment, India, Oregon. You can follow any responses to this entry through the RSS 2.0 feed. You can leave a response, or trackback from your own site.